HO! HO! HO! 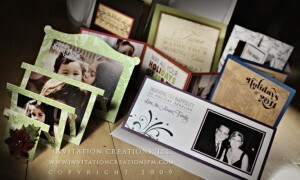 Christmas and Holiday Cards of this Season! Here are some of the Christmas -Holiday- New Years Cards I designed this year! These were a lot of fun and something different than what I usually do. Thi s one is my personal Christmas Card. I wasn’t sure if people were going to know that this is how it was supposed to look since it arrives flat but hopefully they got it!! This one was really unique in that it was 7″x7″ folded card with 4 layers of cardstock! We also did the custom stamps and custom address label. Pretty sweet if I do say so myself. My client Sherri brought this quote to me and I loved it! She personalized every part of this card and I loved it! Here you can see her envelope with the custom label and stamp. This is is a New Years Card and my first swivel card. On one side is this message and on the other was a family photo. We also created custom stamps and a custom address label. These were for a loyal client who came last year for her New Years Card as well and we weren’t sure if we were going to be able to top her card from last year, but I do think we did. I love these! She has had her work and continues to have it exhibited across the country and even overseas!! This client wasn’t sure if we were going to be able to coordinate everything we needed for these Christmas cards, but we did! 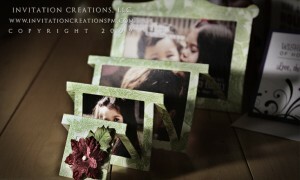 She had the family photos taken by Emily Morgalis Photography. We used a photo of their Christmas tree as the cover and had photos of the evergrowing family and of their grandchildren throughout. Here’s a peek of the message that was the center of their holiday card. I love the Alvarez family. They were one of my all time favorite bride and grooms and actually one of my first clients. I love how our business relationship has been maintained throughout the years. I love this card! Its’ so vibrant and cute! And great for showing off photos! 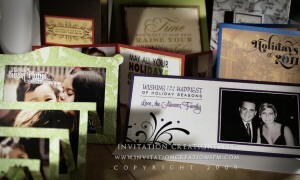 Happy Holidays to old and new friends of Invitation Creations, LLC and I hope to serve you in the future!